This final post on biml SSAS processing and provides the full script to produce two packages. It really ties in the first 2 posts to provide a complete solution for our processing scenario. Remember, our goal is to point our biml at a SSAS database and have a processing package built that only processes the last 2 fact partitions of each measure group based on their last processed date. Firstly, we look at a very conventional arrangement that would process dimensions, partitions and indexes. This looks like the image below. In order to get the most performance (lowest processing time), we need to specify that each processing task uses parallelisation. The code is similar to prior posts so we wont dwell on it too much. Basically, we use AMO (note the reference to the AMO dll in the first line) to connect to our cube, discover dimensions and partitions and these in an iterative manner to each processing task. The two methods in the C# code of importance are DimensionKeys (which returns all dimensions in the database) and Partitions (which returns the last two processed partitions for our intended measure group). A slight word of caution … If you look into the biml code, you will see that we explicitly set the ProcessingOrder as parallel. This specifies that the Processing Order (mode) for the task should be in parallel and that the batch XMLA sent to your SSAS Server should include that option. Unfortunately, this may not materialise on all versions of BIDS & BIML and the default (sequential) may be used. I would check the outcome before implementation. Our second approach is essentially the same as the first, however, in this approach, we encapsulate each each measure group processing command in its own container with sequential constraints between each partition process. Why? Because we want to ensure that our partitions are processed according to last processed date. That is, the last 2 processed partitions should be processed and we should process them in the order that we originally processed them. If we add a new partition, we want to ensure that the one with the oldest data drops off the list. You’ll also notice that we use SSIS containers to gain parallelisation for each Cube and Measure Group. This code relies on the same methods (DimensionKeys and Partitions) used in the prior to build its output. You might suggest that this process is a very long way to build a processing schedule – and you may be right. If you had to build it from scratch once to create a package that does some processing, you might have achieved it faster by hand. However, here’s the thing about automation … you don’t have to code it, its there for you can you can use it to build out your packages and now package creation takes 10 sec! Following on from the last post on dimension processing, the next operation in our SSAS processing strategy is to process measure group partitions. 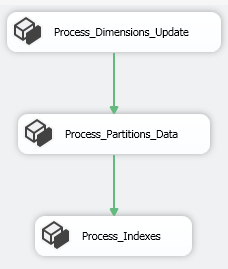 If we remember our scenario, our SSAS database takes too long to process (when we try a full process), so we are forced to process dimensions using a ProcessUpdate and then specific partitions using ProcessData. Of course we only want to process those partitions that have the most recent data and we want to automate this using biml. 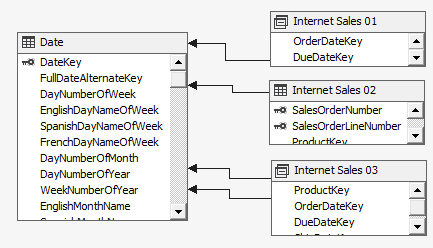 That is, we want to point our biml package at a SSAS database and have the package generated by some logic. Lets assume that we have a group of partitions in each measure group (see left). We will assume that the last partitions processed for the measure group are the most current and therefore, we should choose the last n number of partitions to process (this is based on the individual partitions last processed date). If you think about how you would manage this in a system, consider adding 2009 data. When 2009 comes along, we add a partition and process it. Now that this ‘new’ partition has been added, we want to continue processing it along with the (last processed) partition (ie 2008). In summary, our processing logic needs to look for the last n partitions based on the last process date of the measure group partitions. I will explain this in the code below but there is one little (perhaps very confusing) issue that I’ve found with Adventure Works and you may find this in your version. If I look at the properties for the Internet Sales 2008 partition, I can see the date it was last processed, its name and its ID. In my code, I’ll be using ID but take a look at the ID and Name. 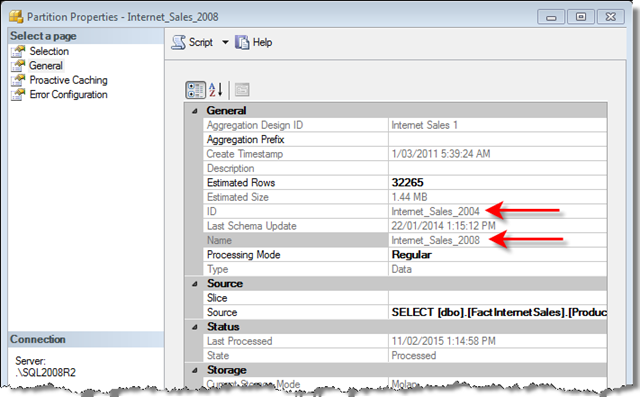 The ID is Internet_Sales_2004 however, the name is Internet_Sales_2008 … confusing right? Here’s the code to produce that output. We can see the iteration of cubes, measure groups and partitions. Note that I’ve also defined a function Partitions to return a sorted table of partitions with the PARTITION_NAME, PARTITION_ID and (last) PROCESS_DT. I’ll have to also include a reference to AMO. To see how this code generates biml, I want to validate the output, so lets test it. In Adventure Works, the 2005 and 2006 partitions in the Internet Sales measure group. These have the ID’s Internet_Sales_2001 and Internet_Sales_2002 (the measure group ID is Fact Internet Sales 1). Below, I can see the generated biml and verify that the correct partitions have been chosen. 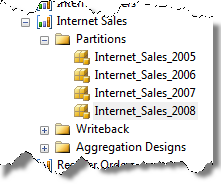 Now, if I’ll process the 2008 partition (through SSMS) which has an ID of Internet_Sales_2004. Assuming I processed the 2006 partition last (in the prior step), I’d expect the 2006 and 2008 partition to be in my processing list. That’s exactly what I see (as in the screen shot below). 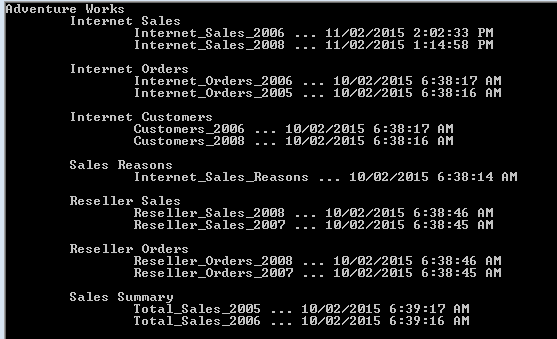 Of course my generated package will show the names I expect (Internet_Sales_2008 and Internet_Sales_2006). So what’s the purpose of this snippet? It provides a way to automate the creation of a SSAS processing task by examining the meta-data of existing database partitions. We assume that we want to continue to process each measure group’s last n partitions and the package is generated for us. 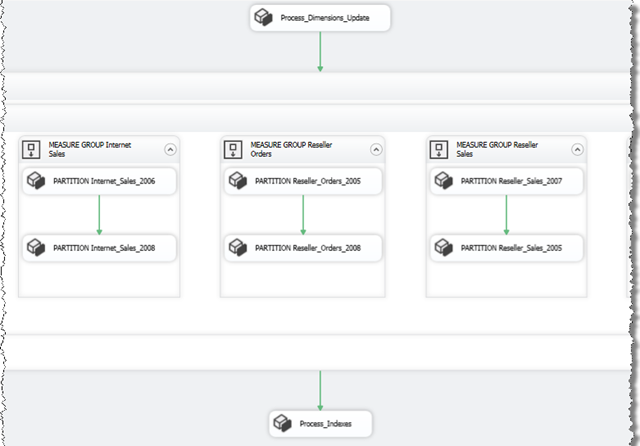 This post looks at building an SSIS package for dimension processing – we assume that you want fine control over the processing of your SSAS cube and so use different processing activities for dimensions, facts and database (more on facts and databases later). The reason why you would want to use a different processing option of each object relates to the processing window for you database. If you have a large amount of fact data, it may not be possible to process the entire database within the allocated time and so we move to an approach where you process the dimensions first as an update and then the measure groups (facts) that have changed data. Dimensions have to be processed using an update so the existing fact data is not cleared. At the end of the post, we’ll have 2 snippets. The first puts all dimensions into a single processing task. Through that, you can specify the degree of parallelisation (it is part of the SSAS processing control) and secondly, our package will put individual processing tasks into a sequence container (with a parallel constraint mode). The idea of the post though, is just to specify the SSAS server and the database and then have biml generate the package for you. C:\Program Files (x86)\Microsoft SQL Server\110\SDK\Assemblies\Microsoft.AnalysisServices.DLL . The SSIS control flow includes a SSAS Processing task. In biml we can implement the with a simple example that processes the Account dimension of Adventure Works (as in the following). The important parts of the processing task is the processing option and the dimension id (not its name). Of course, the dimension id may be different from its name (as the following screen image shows … remember that this is Adventure Works). Naturally, if we want to process other dimensions as part of this task, we would include more DimensionProcessingConfiguration tags within the ProcessingConfiguration node. I think the key takeaways for the code are the inclusion of the AnalysisServices assembly (we have not looked at this before) and the use of server, database and processing types as ‘control’ strings at the start of the code (meaning they will only need to be set once in the code). The iteration over each dimension to add a processing configuration (dimension processing command) should not be unfamiliar if you have been following this series. Alternatively, our strategy could be to create a processing task for each dimension and then wrap that in a container. Note that the container has a parallel constraint which allows some parallel processing. Our package will look like the following. This post includes two snippets for building dimension processing packages. The approach (using ProcessUpdate) is required as the first stage of processing when the database is too big to be processed within the allowed window. This post started on a technique that could be used to build an automated cube processing package. The idea was that we could simply point our code at a cube, press play and then create a highly defined package in SSIS. Some may suggest that you could simply process the entire database and cut down on the code. That approach is unworkable in larger implementations where processing windows are small and cube processing does not complete in the allocated time. I was planning a different approach whereby dimensions are processed and then desired measure groups. The first stage therefore was to define code that would list dimensions and that is the purpose of this post – return a dataset with unique dimension information. There are a few ways to do this, each has its own challenges. I am using Adventure Works (2008R2) in this post and have included a reference to the SSAS Amomd client. For other illustration, I have also created another database based on Adventure Works. It has three cubes (titled Internet Sales NN) with a single roleplaying dimension (Date). The Date dimension is connected to Internet Sales 01 & 02 once and Internet Sales 03 twice (as below). Looking at the output, there are two main things to note. Each dimension is included twice – once identified as a Measures name and once identified as a dimension (see field DIMENSION_NAME). This effectively duplicates the rows returned (for my purpose). The dimension is listed for every cube that it is attached to and the also database. Database dimensions are identified by a $ as the CUBE_NAME (see the first 2 in the image above). Essentially, the database dimensions are the ones we want to identify – not those attached to the cubes. Although the DMV syntax appears similar to SQL, it is not fully SQL compliant and so we are restricted in command that we can issue. For example, the keyword Distinct is supported (as is where), however some operators are not supported operated (for example a like comparison or a subquery). Therefore, I cannot use the following command (which would seem ideal). Alternatively we could connect to the database and then use the ADOMD object to interrogate its structure. This may seem a little redundant when this information is supplied in the rowset above however, it allows us to identify the objects we are interested immediately and use them. It is also important to remember that the dimension is defined as a cube in metadata (these were the $ cubes above). Therefore, what I would want to do is connect to my database, iterate over all cubes and identify those which are dimension (types). This can be done easily with the following snippet. Given that reference to _cd, you may think it would be easier to identify the dimension unique name and the meta-data as extracted through the DMV. However, this is generally not the case and that data is scattered through properties, a property array and a dimension and measure object which both reside in a dimension object. To discuss the idea of a dimension having a dimension property, it may be easier to recall that we have 2 rows for each dimension in the DMV (both a dimension and measure) and these are referred to as dimensions of the dimension. Luckily, the dimension is given the first index in the array and the measure dimension is given the second index. Consider obtaining the dimension unique name. I can get the dimension name ($Date) as a property of the dimension (_cd.Name) however for the unique name, I need the dimension property I may want the dimensions unique name (which is [Date]). In order to do that I have to expose the dimension property or (if available) use a property. Finally, we can return the DMV row set by returning the schema dataset in ADOMD, that is, the results of a $system query (above) by the GetSchemaDataSet method. Using this method we can restrict our results based on restriction collections that are passed to GetSchemaDataSet (note the section on Restriction Columns in bol). The table returned has exactly the same structure as in the first method, however, an important difference is the default restrictions that are applied to the result (see bol for the default values). For example, by default, only visible dimensions are returned (in contrast the DMV statement returns all rows). If we want to overwrite that default, we have to include restrictions. Bol lists 2 options for visibility (visible or not) however, unfortunately they are not incremental and adding the same restriction simply replaces prior values with new. For example, below, I set the visibility restriction to visible and then not visible and not visible is used. Finally, we can also use AMO (Analysis Management Object see here). The AMO classes are different from the AMOMD class in the way that AMO is designed as a management API rather than a query interface. Some information is not available via the DMV’s or through AMOMD (for example the dimension ID) and for that we need to dig into AMO. This post has looked at deriving dimension data from the cube via a DMV command, the adomd model, a schema dataset and the AMO library.